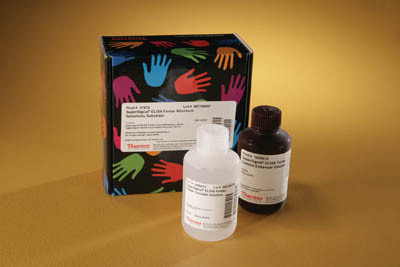 HRP substrate formulated for superior protein detection and low-end linearity in chemiluminescent ELISA applications. SuperSignal ELISA Femto Substrate generates detectable chemiluminescence (light) within one minute of addition to trace amounts of soluble HRP, saving up to 30 minutes per assay compared to colorimetric ELISA substrates. This feature is ideal for high-throughput screening (HTS) applications in which as many as 100,000 assays can be performed daily on robotic equipment. 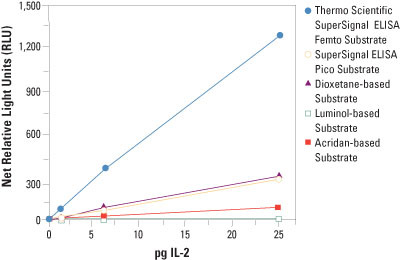 Because incubation periods are often a limiting factor in the development of rapid automated assays, SuperSignal ELISA Femto Substrate is the logical choice for automated HTS applications. Requisitos de almacenamiento 4 °C durante un máximo de un año o a temperatura ambiente durante un máximo de seis meses.